​The difference between servo voltage regulator and static voltage regulator is that there is no moving parts in static voltage stabilizer. This is an advantage for static voltage stabilizer, because they do not need to get maintenance. They are not abraded and they will be ageless. Voltage stabilizers and voltage regulators are necessary to protect your sensitive devices from the over and low voltage. If there is a sudden chance on the voltage range, ıt can cause really harmfull results. Our 45 kva static voltage stabilizer solutions help your loads to have TV / Radio transmitter stations, GSM base stations, image and sound production studios, air - conditioners medical devices, hospitals, neon and laser illuminations, press and textile machines, photograph press machines, submerging pumps, ships, electric motors and all electrical devices sensitive to voltage changes. Static thyristor controlled voltage stabilizer used as well as regulating voltage, also increasing protection level and increasing electrical efficiency. Our 45 kva servo voltage stabilizers supply electronic protection against to over load, low voltage, high voltage, over temperature, over current, harmonic filter and short circuit. The 45kva static voltage stabilizer, servo voltage regulator have been produced in Germany or in Europe. The voltage stabilizers are here to use for different applications as well as electrical protection as 45kVA. Design of the 45kva static voltage regulator or static voltage stabilizer machine is prepared in Germany, production process is done in Europe. 45 kva static voltage stabilizer, servo voltage regulator machines are tested by our expert engineers for long time to be sure that they are convenient for every situations. 45kva static voltage stabilizers has advanced monitoring options to make the usage of the operators easier. There is also multilanguage option that you can choose the language. Correction rate of the 45kva static voltage stabilizer Germany is really fast. You can access easily from all of the sides of the voltage stabilizer. After the production of the 45kva servo voltage stabilizer and static voltage regulators, our experienced engineers test the machine according to long test procedure. 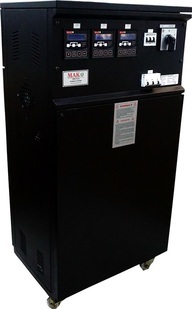 ST-MAK GERMANY 45 kVA STATIC VOLTAGE STABILIZERS is a high technological solution for operation of your sensitive devices without any problem wherever the main supply is not trusted. Produced of high quality semi-conductor materials, that can operate with high efficiency under extreme & fast voltage changing conditions. Thus, it has extremely high speed response (500 V AC/sec.). Easy usage with its compact design, maintenance free and long life facilities. The stabilizers has CE certificate as well. We produce as single phase stabilizer wide range of voltage stabilizer. The power range is 3 kVA / 3000 kVA from Germany. 45 kva static voltage stabilizer are SMPS based which uses IGBT technology. We also offer you low investment and operating cost with our 45 kva static voltage stabilizers and voltage regulators. With the 45 kva voltage stabilizer technology, your expensive and sensitive industrial devices and machineries are protected against dangerous voltage changes, harmonics and also it enables your systems to work with high efficiency and without interruption. Please ask us prices with your project for Static Voltage Regulator and stabilizer solutions. We highly recommend you thyristor controlled voltage regulator for your critical solutions that also used as passive harmonic filter. We produce also customized static voltage stabilizer solutions 45kVA voltage stabilizer, 45 kVA stabilizers can be produced also for a outdoor solution.